A long time ago (primarily the 80’s) — in a galaxy not far from here — five young lads began playing rock professionally in the Twin Cities area. 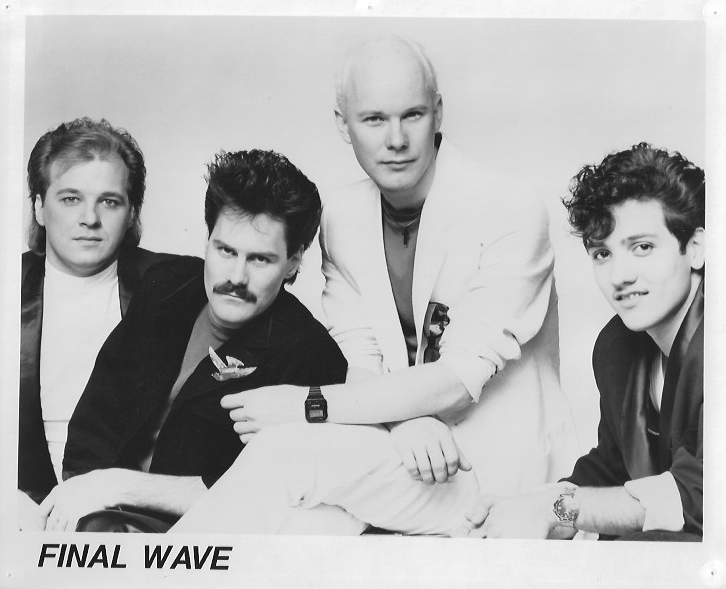 Three of them (Lauren, Scott, and Skye) formed a band called Final Wave and one (Matt, with a few other guys) formed Argyle. Both bands enjoyed success in the Club, Bowl, and College circuits. The fifth, Sequel, is shrouded in mystery and intrigue but he plays keyboards and can really sing … soooo …. Final Wave had the pleasure of opening for some fairly well known groups such as The Guess Who, Ozark Mountain Daredevils, Stryper (yeah, we know, but they were pretty good! ), and more. They also worked with local bands like Raggs, Fragile, Fairchild, and Chameleon (when Yanni was with ’em). Patrons and staff would go out of their way to say it was nice to have two good bands on those nights. The Final Wave crew was good natured and irreverent, the boys constantly interacted with their fans, in fact, one noted he’d never seen a band heckle an audience before … which led the club manager at the old NIBS to point out he wasn’t sure whether he was paying a band or a comedy act. In typical fashion, the guys suggested the club should probably pay them double. Matt says he always wanted to name their first live album … “Tour of the Basements”. Seems legit. 04.01.2015 NOTE FROM Admin: Matt, we could really use a bit more information about this “Argyle” entity (if that is it’s real name). We’ve asked repeatedly but, to date, have received nothing but shrugs … and while a good shrug is truly satisfying it doesn’t meet the criterion of delivering meaningful content. Did you have a promo pack? A promo Pic? Did you hand draw your posters on napkins?! Think about it — No, YOU think about it! 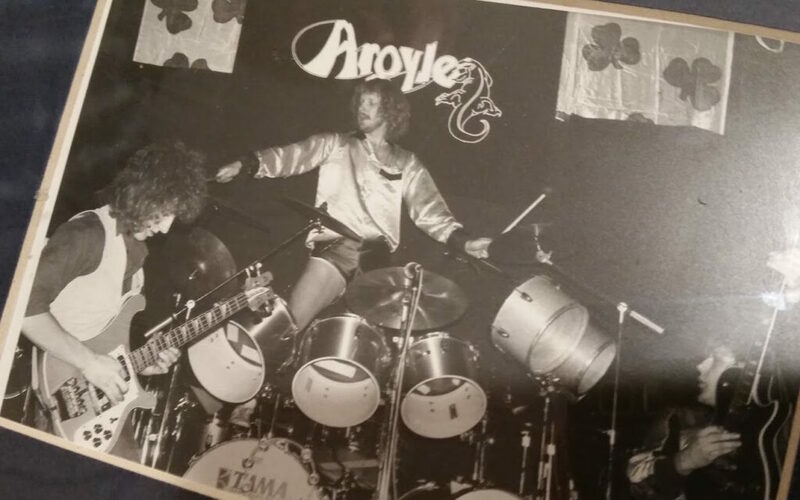 10.01.2016 NOTE FROM Admin: So, now … after about a year and a half of — literally BEGGING for something — Matt provides a picture of a picture … where the band appears to be named “Aroyle” and NOT “Argyle”, as claimed. Also, he’s wearing satin shorts. Words escape me. 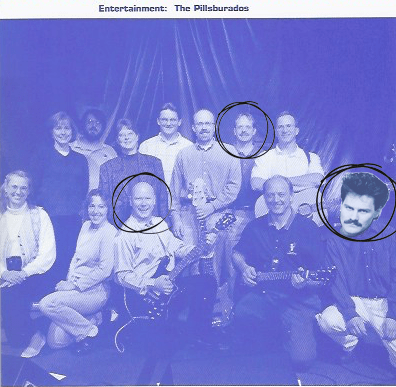 Lauren, Scott, and Matt worked together and, some time later, formed a company band called Pillsburados. 12.15.2015 NOTE FROM Admin: Guys, more info about gigs and/or personnel would be nice here. We’ve asked for this information but it’s like talking to Muppets sans their puppeteers. (Matt seems to be the common denominator in all of this lack of information … just sayin’). 09.15.2016 NOTE FROM Admin: So, 9 months (NINE MONTHS!) after the request for more information goes out … we get a picture of the famed “Pillsburados”. We have it on good authority Matt, Lauren, AND Scott were in the band … yet are provided with a picture that is 33% light when it comes to proof. No worries … I TOOK CARE OF IT! ~admin. Here’s a pic of the band circa 2001 from the Pillsbury “Gazette” (or something). Displaying a dizzying intellect and nearly perfect timing … the Sequel appears to be the only member of the band with a lick of sense … proving he’s not just another pretty face. A friend of Matt’s from his French Foreign Legion days — Sequel was a cook specializing in crepes and escargot. We’re hoping not at the same time. In this vintage photograph (left), Sequel sits at the piano for a stirring rendition of La Marseillaise (or Love Lies Bleeding/Funeral For A Friend, the caption has faded with time) with the French Foreign Legion Glee Club in the mess hall at a French Foreign Legion compound outside of Addis Abbabbbabbba (NOTE FROM Admin: that’s not a typo — it’s a REAL PLACE … it’s Latin for …. Arden … Hills!). And, yes, there are Christmas Lights in his hair. Now THAT'S a name for a rock band! Fast forward to present day over a dinner consisting of gruel, pre-moistened potato chips, jello and Manischewitz Concord Grape wine, it was discovered these five geezers still wanted to play. During an early rehearsal, and after a particularly rough performance of … “The Green, Green Grass of Home” (or something by Scorpions, the guys can’t really recall) it was suggested the new moniker should be ‘Train Wreck’ … that way audiences would be forewarned. After some research it was decided FLYING TRAIN WRECK would be the ensemble’s official name.